...factors is fueling a heated race to scoop up top AI startups, many of which are still in their early stages of research and funding. The timeline above shows the M&A activity of corporations that have made 4 or more acquisitions since 2010. 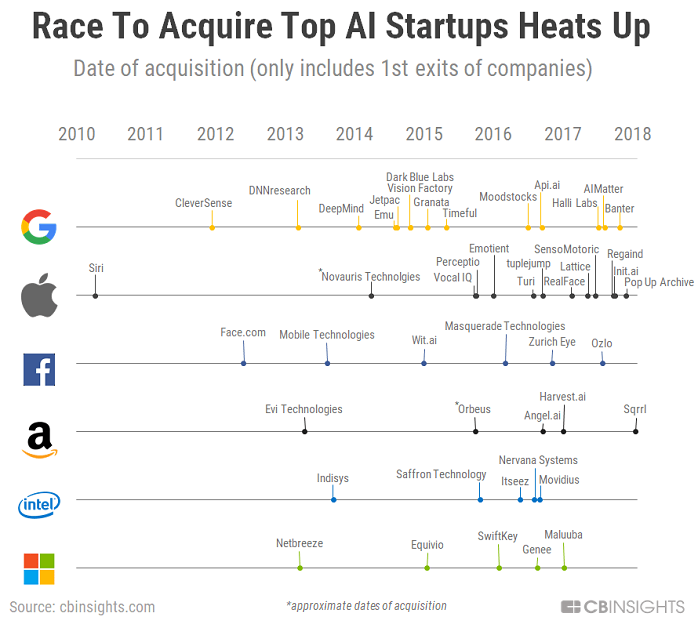 Google is the top acquirer of AI startups, with 14 acquisitions under its belt (excluding Kaggle, a data science community that hosts machine learning competitions). In 2013, Google picked up deep learning and neural network startup DNNresearch from the computer science department at the University of Toronto. This acquisition reportedly helped Google make major upgrades to its image search feature. In 2014 Google acquired British company DeepMind Technologies for some $600M (Google’s DeepMind program recently beat a human world champion in the board game "Go"). It also recently acquired conversational commerce platform Banter. Google previously made another major acquisition in natural language processing - startup API.ai - in 2016, powering some of Google Assistant’s capabilities. Apple is close behind with 13 acquisitions. Apple was one of the earliest players in the space. It acquired Siri in 2010, popularizing AI assistants. For comparison, the technology behind Amazon’s Alexa can be tied back to the startup Evi Technologies, which Amazon acquired in 2013. Disclosure/Disclaimer: Ralph Gollner hereby discloses that he directly owns securities of Amazon (AMZN), Apple (AAPL), Facebook (FB), Google/Alphabet (GOOGL), Intel (INTC) and Microsoft (MSFT) as per 16th June 2018. Disclaimer/Hinweis nach §34 WPHG zur Begründung möglicher Interessenkonflikte: Aktien von Amazon (AMZN), Apple (AAPL), Facebook (FB), Google/Alphabet (GOOGL), Intel (INTC) und Microsoft (MSFT) befinden sich aktuell im "Echt-Depot" von Mag. Ralph Gollner - per 16. Juni 2018.